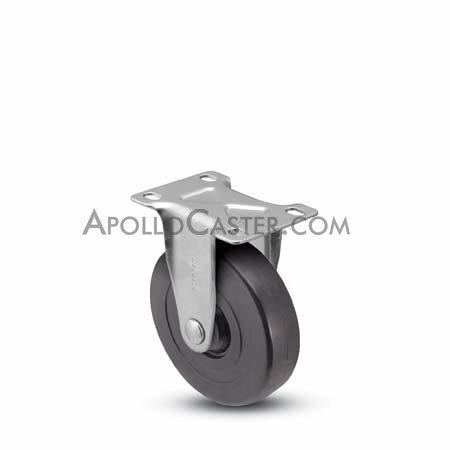 The Hard rubber wheels are one-piece molded construction, available in black or grey, and have a higher load capacity than the soft rubber and will not flatten while sitting under load. They provide an easy roller, and easy start-up along with great durability. Also resistant to most chemicals, oils, grease, solvents and cleaning agents. The soft rubber wheels are a good choice for those applications where the average load is light with occasional loads using the full capacity of the wheel. Soft Rubber wheels are manufactured of quality materials with a resilient rubber tread bonded to the hard rubber core. These wheels are an economical choice for moving equipment. The soft rubber wheels, if overloaded, can result in flat spots making initial rollability more difficult. Do not use in oil/ grease situations, where metal chips/ filings are present, or in high temperature environments. Be alert that these wheels may not be non-marking.